Estate (private use): approx. 300 m², garden. Outdoor facilities(private use): furnishing provided, 4 deck chairs, sunshade, barbecue. Wellness: shared use (free of charge): sauna, infrared sauna, steam bath. Infrastructure: bikeshed. breakfast, half board: payment and request on-site. Important information: Against payment: Sauna, steam bath, infra-red cabin, solarium, massage showers, heat bench, heated waterbeds, breakfast, half board and additional double room at the hotel "Unterkrämerhof" (approx. 100 m). Center Fusch in approx. 50 m. Bruck in approx. 7 km. Zell am See in approx. 12 km. Next shopping possibility in approx. 50 m (Fusch). Train station Zell am See in approx. 7.6 km. Airport Salzburg in approx. 93 km. Ski run Piste in approx. 100 m.
Ski bus stop (free shuttle bus) in approx. 50 m (Kaprun/ Zell am See). Cross-country skiing trail in approx. 500 m.
detached house, 6 - 11 people, 5 room/s, 3 bedroom/s, 2 bathroom/s, approx. 130 m², 2 floor/s, partially renovated. Please note: Non-smoking house. Furnishing: friendly, bright, carpet, laminate floor. 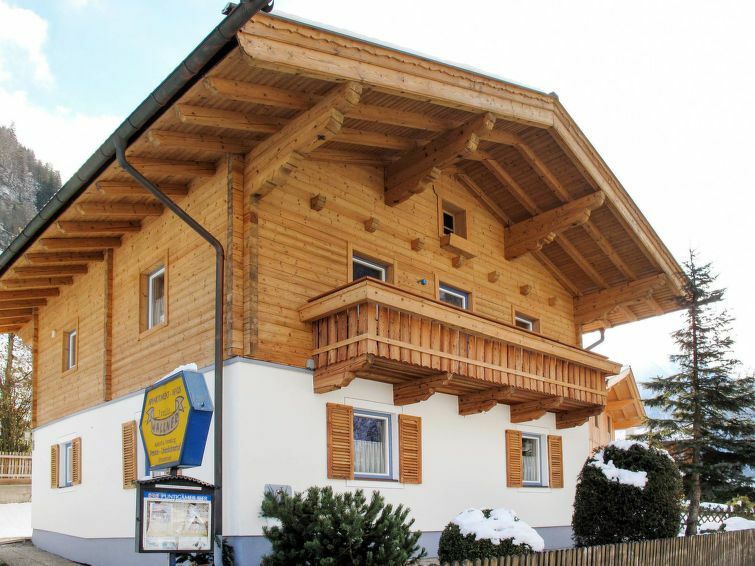 Equipment: cable TV; radio; internet access Wi-Fi (included); safe; oil central heating; ski storage facility. Living room/bed room(ground floor): sofa bed. Living room/bed room 2(floor 1): double sofa bed. Dining area: (corner bench) for 6 persons, in the living room, (ground floor). Dining area 2: (corner bench) for 6 persons, in the living room, (floor 1). Kitchen: open to the living room (ground floor), wood stove. Kitchen/ cooking equipment: 4 electric plates, oven, microwave oven, dish-washer, refrigerator, coffee machine, toaster. Kitchenette 2: in the living room (floor 1). Kitchen/ cooking equipment: 2 electric plates, microwave oven, refrigerator, coffee machine. Bedroom 1(ground floor): double bed, sofa bed. Additional information: direct access to sanitary no 1. Bedroom 2(floor 1): double bed, double sofa bed. Sanitary 1(ground floor, access from one bedroom only): bath, WC. Important information: maximum occupancy 11 people. Local service charges 23.11.19-25.04.20 € 25 per person and stay (depending on occupancy), 25.04.20-17.10.20 € 4,50 per person and day (depending on occupancy) plus Holiday resort tax. Linen/towels Bed linen available. Towels must be brought along. Deposit € 250 (in cash). Cot/​High chair free of charge (on order). Pet 1 pet allowed, € 10 per day (please advise prior to arrival; additional animals on request only). Equipment: cable TV; radio; internet access Wi-Fi (included); safe; oil central heating. Local service charges € 20 per person and stay (depending on occupancy) plus Holiday resort tax. Linen/towels Bed linen available. Towels must be brought along. Deposit € 250 (in cash). Cot/​High chair free of charge (on order). Pet 1 pet allowed, € 49 per stay (please advise prior to arrival; additional animals on request only).